I used plastic six pack rings and tulle remnants to created this outfit showed at British Council's Trashion Catwalk. My inspiration was the thousand of plastic rings floating on the sea and how this contaminates and induces to Global warming threatening sea life. We need of making more people aware of this by promoting Recycle activities. Unidos por un Mismo Corazón- ( Nombre del collar... Elaborado con recortes de sixpacks, color plata- el cual representa a cada uno de nosotros, unidos con un lazo rojo- el cual representa el lazo de amor que nos une.. unido a un corazón purpura- el cual represental el AMOR Y LA FE!!! Ever since I started making things with my hands I was interested in the materials I had around me. My parents helped my creative mind take waste and make something beautiful and useful out of it. Now as a professional costume technician and artist I am even more aware of the uses of materials that usually are thoughtlessly thrown in the garbage. When I discovered the Origomu project by visiting the FIT Museum’s Eco-Fashion: Going Green exhibit I found a community of people who shared my ideas. 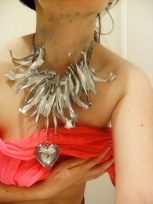 After I created my necklace ‘Joyful’ I felt empowered. I never thought of my art making a large impact on the world, but being involved in a worldwide movement maybe it can. I now see 6-pack rings on the street, in the grocery store, and at social events and I pick them up and bring them home so they can become an object of beauty instead of destruction. 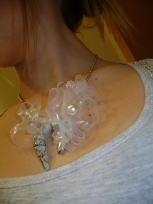 By making art out of materials that can harm the environment I hope to inspire others to do the same. I discovered the contest through the school, I suppose the teacher has spoken there because she knows the mind of some of us. What led me to participate was the passion and curiosity with which to observe the animals. Save these creatures ... I think it's one of the many important things that man is often forgotten. The sea is an enchanting beauty, as you can think of any way to go and pollute with objects of this kind, when he also gives us the soul to make us survive. The ability to transform one of these objects into something creative and useful me excited! It reminded me of the phrase: "Nothing is created, nothing is destroyed, but everything changes!" Thank you all for this, and sorry if I was wrong to write in English. 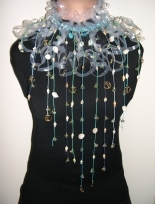 El tema del collar esta inspirado en las medusas (Gellyfish), esta elaborado con 20 sixpacks, los cuales salieron de Puerto Rico, de ahí a New York y su última parada es República Dominicana, la composición del mismo consta de cristales de Swarovsky en colores azul aqua, verde, transparente imitando lo que es el océano, las playas y las olas, piezas de nácar azul aqua, pequeños anclas dorados en pewter y por último pero no menos importante el tejido del mismo esta realizado en un material llamado Terlenca y lo tenemos en los colores baby blue, azul cielo, blue navy, azul aqua y teal. We are overwhelmed with the incredible response from designers around the world and how Origomu is touching people's lives. We are happy to know we are not the only ones with the same concern of saving birds and marine animals. Thank you all for inspiring us! the origomu team. Share your comments, stories and picture of your Origomu experience. * Required fields / Upload max file size: 8M.